In BricsCAD you can customize the settings that control your drawing environment, which can then be saved in a user profile . You can create multiple user profiles, e.g. a profile to run BricsCAD with a white background and a limited set of toolbars and another profile with no command bar and all toolbars and snap settings needed to draw comfortably in 3D. User profiles can also be used when multiple users share the same computer and each user likes to create his personal drawing environment. User profiles can be saved to a file, which can then be imported on a different computer. This allows you to copy your settings to a new computer or to install the same settings on multiple computers. If you use a third party applications on top of BricsCAD, you might want to create a user profile to use with each of these applications. The User Profile Manager is a standalone tool that lists the existing profiles and provides all the tools needed to Load, Create, Set Current, Copy, Rename, Delete, Export and Import user profiles. User profiles save many settings that control the drawing environment. Once you start BricsCAD using a user profile, it automatically tracks and stores changes that you make to your drawing environment. Current Workspace: BricsCAD has five standard workspaces: 2D Drafting, 3D Modeling, Mechanical, Sheet Metal and BIM. Configuration settings: all system variables which are saved in the Registry ( ) and user preferences. Settings in dialog windows, e.g. search options in the Settings dialog. 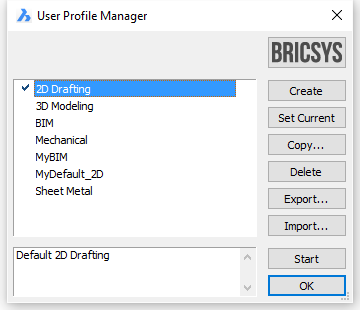 When BricsCAD is running: choose User Profile Manager in the Tools menu. From the Windows Start menu , choose All Programs > Bricsys > BricsCAD > User Profile Manager . Double click userprofilemanager.exe in the BricsCAD program folder (e.g. 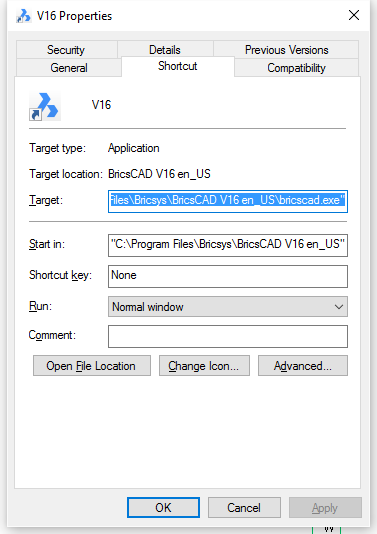 C:\Program Files\Bricsys\BricsCAD Vx). The Current Profile is marked. Create : Creates a new profile, using default settings. 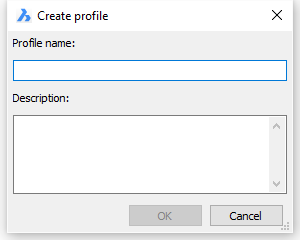 Set Current : Sets the selected profile as the current profile, which will be used the next time you start BricsCAD. Copy : Click to make a copy of the selected profile. Delete : Click to delete the selected profile. Export... : Click to save the selected profile to a file on your computer, disk, or network. The file is saved with an .arg extension. Import... : Click to open a profile that has been saved to .arg file). Start : Starts BricsCAD with the selected user profile. Double click a profile in the list of the available profiles to start BricsCAD using this profile. Launch the User Profile Manager. Click the Create button on the User Profile Manager dialog window. The Create Profile dialog opens. Type a name for the new profile in the Profile name field. (option) Type a description for the new profile in the Description field. Click the OK button to create the profile. The new profile is added in the available profiles list. The new profile is created using default hard-coded values for all settings. Use the Copy option to create a new user profile as a copy of an existing profile. When you start BricsCAD, the user profile that was current when you closed the previous BricsCAD session is used. If the GETSTARTED system variable is ON, the GET STARTED page of the Welcome dialog box displays on startup. Here you can select the user profile you want to use. Add the /P option to the Target settings of the BricsCAD shortcut. To open the shortcut settings dialog: right click the shortcut icon on the desktop and choose Properties in the context menu. Launch the User Profile Manager, then either double click a user profile or select a user profile and click the Start button. The /P option is case insensitive. If you load a user profile when BricsCAD is already running a second instance of BricsCAD is launched, at least on condition that the SINGLETON variable is OFF. This variable controls whether multiple BricsCAD sessions can run simultaneously. See the Settings dialog for more information about variables and settings. If the user profile in the argument of the /P option does not exist, the user profile is created automatically using default hard-coded values for all settings. If the user profile name contains spaces, use double quotes: e.g. /P "background white". Choose User Profile Manager in the Tools menu. Select the user profile you want to start up with. Click the Set Current button on the User Profile Manager dialog. Once you start using user profiles, you may need to copy, rename or delete them. Copying a profile is a quick way to create a new profile based on an existing profile. Select the user profile you want to copy. 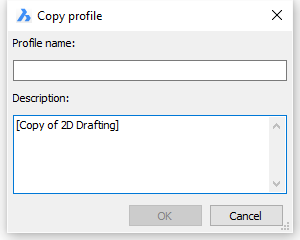 The Copy Profile dialog displays. Select the user profile you want to rename. Click the name of the selected user profile. The Profile name field is active now. Type a new name in the Profile name field. Click outside the Profile name field. Select the profile you want to edit the description of. Select the user profile you want to delete. Click the Yes button on the confirmation box to delete the profile. The current profile cannot be deleted. Select the profile you want to export in the profile list. Select a folder to save the user profile in. (option) Edit the name of the profile in the File name field. The file is saved with an *.arg extension. Select a user profile file (*.arg). The Import Profile dialog displays. (option) Type a different name in the Profile name field. (option) Edit the profile description. Click the OK button on the Import Profile dialog. The profile is added to the profile list. When you import a user profile of another user all user dependent search paths (e. g. the local root and roamable root folders - see BricsCAD User Files) still refer to the other user, as a result the folders cannot be found and error messages such as "Unable to open program parameters file: default.pgp" might pop up when you start BricsCAD. Open the exported user profile (*.arg) in a text editor such as Notepad. Replace the user name dependent references with an environment variable. On a Windows XP computer replace C:\\Documents and Settings\\username with %USERPROFILE%. On a Windows Vista or Windows 7 computer replace C:\\Users\\username with %USERPROFILE%. Use the Find/Replace procedure to quickly replace all references. Start BricsCAD using the imported profile. The environment variable %USERPROFILE% will be replaced with: C:\\Users\\currentusername . Environment variables in profiles, using the %<variable_name>% format, are supported in V10.3.11. and higher.